by Jenny Mitchell | May 3, 2017 | Coach Pep Talk, Inspire Me! 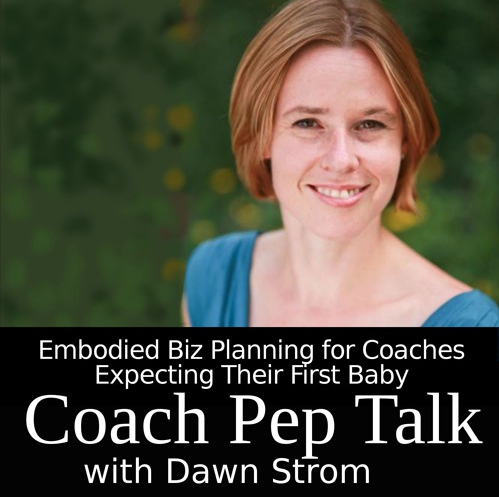 In EPISODE 8, Dawn Strom reveals the amazing progress that can be made in your coaching/wellness business when you know a little one is on the way. Get the scoop on thoughts before and after “the baby”. And actionable tips on what you can do for your business while you are pregnant. Benay: Welcome back to Coach Pep Talk, the podcast for people who run their own coaching businesses. Each week I talk to an expert who shares wisdom that helps us become better coaches and better coaching business owners. This week I’ve got a holistic wellness coach who decided to completely overhaul her coaching business when she found out she was going to have her first baby. She’s going to tell us all about that journey and give us some awesome tips that are in alignment with her wellness program, so check us out on the other side. Benay: Coach Pep Talk is proudly brought to you by Life Coach Office. Wow, your clients with your online coaching capability and gain ultimate freedom and flexibility as a coaching business owner. Now one thing that’s really great about Life Coach Office is the support community that’s out there. We’ve got a fabulous team of support people who are there to help you with any questions you may have. We also have an active Facebook group that’s private for people who are checking out or members of Life Coach Office. And I’ll add a link to that group in this show’s show notes. Now the best way to find out if Life Coach Office is going to work for your coaching business is to just sign up for the free seven-day trial. You don’t need a credit card. All you need is an e-mail address and you’ve got access to the full capability of the system for seven days and you can make a decision from there. If you’d like to sign up for that trial please go to https://lifecoachoffice.com. Benay: We’re really lucky today to have Dawn Strom on the line. Now Dawn is a holistic wellness coach which means basically she combines all of these different disciplines like Reiki and somatics and coaching and philosophy, Gyrotonics into her own unique signature coaching program. But on top of all of that coaching expertise, Dawn has also had her first baby and she decided to completely reorganize her businesses, is she actually has two, around right before she was due to have her baby. So she’s going to talk to us about the wisdom of being in your body and how you can do that to create new movement your life. But also she’s going to share with us her experiences with that before and after the baby if you will. And being an owner of a coaching business. So if any of you out there are expecting your first baby I think this is going to be a great episode just for you. Benay: Hello Dawn and welcome to the show. Dawn: Hey Benay, great to be here. Benay: I’m so excited about our episode today because we are going to talk about being in your body and the importance of that and some other cool stuff about becoming a mom. But this is something I’ve personally been dealing with,, not becoming a mom, but being more in my body. And I really look forward to hearing everything you have to say about that because it is such an important part of, I guess, having sustainable coaching business. Having a body that actually keeps up with you. So yeah. So let’s get started. I know that you’re a big believer of being in your body. So for the coaches listening who might be really unfamiliar with this concept, I was wondering if you could set the stage and just explain what you mean by that so that all of us are on the same page? Dawn: Yeah it is definitely a big concept. And you know I really think about it kind of from a practical, kind of existential perspective in the sense of really just being present. And I know this can be kind of cliche to be in the moment, but you know I think about it as kind of an expanded sense of presence and being in the moment where you really take in you know kind of the whole palette of your experience to work with. So you know you can, as well as your thoughts you have like your sound, image, intuition. You know you can be attuned to colors, to temperature, you know there’s just so much information that you can get at from your experience of being in your body, that can really just help you understand yourself, to make decisions in your life. So I think of it on one level like that. You know from a life coaching perspective, especially in a wellness coaching perspective because I think a lot of times you know some kind of, you know traditional maybe coaching models might be a little bit loaded towards the mental aspect of things, you know, and I think really learning how to drop into your body and just kind of sit what your experience and be able to really take in the big whole picture of it can just be a really amazing place to start from, regardless of what you’re working with you know when you’re coaching work. So. Benay: I think I think that’s a really good introduction, it’s just hit me that you know, could you give us a little exercise that we can all try so that everybody like totally feels that feeling of being in their body? Benay: What can we do? Dawn: Yeah it was just a really simple way to start you know and certainly like a traditional meditation practice uses the breath as an anchor. And so, why don’t I actually just use that and we’ll kind of do a little, I’ll call it a little somatization, so somatics is a word you may hear, it’s actually kind of become a little bit of a buzz word in coaching. It basically just means body, it’s just a fancy Greek word for body. Benay: Thanks for explaining that to us! Dawn: Yeah. It’s actually becoming kind of a new trend and coaching. So if you run into it you’ll know what it is. But you know it’s a little bit of a body journey of sorts, so if you want to just go ahead and start by sitting on a chair, preferably one where you can kind of scoot to the edge of it so you can really get your feet down on the floor. Benay: I hope nobody was driving while they’re are listening to this. Dawn: Yeah I know! I was just thinking about that. Benay: Yeah. If you are driving then come back and do that exercise later. It’s just lovely. Yeah, I felt like, I don’t know. So being in my body in that instance, I don’t, you guys I was telling Dawn before my ankle was having some really bad problems and I’ve got some nerve stuff because of this long story, which I won’t go into but doing that whole exercise, all of that pain and everything just felt really light and sort of evaporated into the floor. It was a great feeling. So thank you! Benay: That’s good and I think that you know people being able to experience it, now okay they can understand, ok that’s what she means by being in your body. So thank you, I’m glad we did that because that lets everybody feel it from a kinesthetic perspective. Dawn: I was just going to say I think there’s a really key element to that too that you know you know, The body really reminds us that we’re kind of all in the same boat right? You know and everything’s interconnected and all of our systems are interconnected and we’re interconnected with each other. You know, like we both had an experience of that and we both felt relaxed and you know and I think that there’s something really powerful about that too in terms of why it’s so important as a concept and also as an approach you know. Benay: You’ve kind of answered the next question, yeah, so let’s talk about why being in your body is so important, and if we could focus specifically on people who are owning coaching businesses because that’s who our listeners are. What does being in your body give to that coaching business owner and possibly that coaching business owner who’s going to be a new parent soon? Dawn: Yeah well I think it’s two-fold in terms of you know what embodiment, or being in your body, and when I say embodiment that’s really what I’m referring to, what it can bring to coaches. You know one aspect of it is really personal you know, I think that as a coach it’s really important to you know just continue to do your own work and continue to develop your own practices of self-care and self-understanding. And I think that you know really taking the time to check in and make sure that you’re really tending and taking care of your physical well-being, your mental well-being, your spiritual being can really help to create a supportive structure for you to be the best in your coaching business and also to really you know, help you continue to expand your range of experience and tools that you have for working with experience that you can bring to your coaching. So I think that’s the other aspect of it where you know I think this piece about really bringing the body into coaching as a tool to really help people understand themselves to connect into a bigger range of perspectives other than you know maybe just the mental perspective, I’m thinking, but also to really you know tap into what they’re kinesthetic perspective is. What colors might come up for them? What sounds you know? Those whole ranges of information that really you know it’s really a practice. A lot of it’s you know something you got to you know either remember you know how to do, or a kind of re-learn. Or you know I think in that sense it’s really something that as coaches we can help people to really cultivate, that kind of awareness in their lives and really use it. Use it to live a more full life. Use it to make choices from you know a bigger perspective, or have you know be able to really pull in different information, maybe from your intuition like I said. You know as well as thinking critically and reasoning about a problem you may be trying to solve. So you know I think it’s really important for those two aspects, you know one for the coach to really stay healthy in your body and to stay connected and to be expanding your range of experience, and also to really bring a deeper listening and broader tools to your coaching practice too. So yeah I think those are both really important aspects of it. Benay: I’d like to I guess add an example to that, I know like as part of my neurolinguistic training, uh NLP, neuro-linguistic programming I did ages ago, You know they’re always encouraging, you know a lot of their interventions and techniques involve visual, kinesthetic, and auditory component to it to evoke and kind of bring in the whole body. I think that’s what they’re trying to do there. And I know in my experiences coaching clients when I do remember to bring in you know, evokes all of those things, those senses in when we’re dealing with a problem and help the client connect in that way it is so much more powerful. It’s amazing. Then if you just you know stay with your primary one. Benay: I’m always visual so I tend to do that. But if I remember to bring in the auditory, the kinesthetic and help the client connect at those levels, it totally gives a deeper thing and that’s a really simple thing to do. It’s nothing, I mean you take it to a whole other level again, but so coaches can actually use this stuff as a really effective tool, powerful tool actually let’s say, to help clients achieve a transformation. Dawn: Yeah I really think so. And I think too, the bigger piece, you know for my training I’m a somatic movement therapist. So really working, before I became a wellness coach, so my training is really in movement and you know, touch and movement and these senses, these ways of engaging with our world, those are really primary before we have you know sort of cognition or you know thinking in the way we think about thinking you know. And so I think that part of why it’s so transformational to really bring in those aspects is because it creates a direct experience for people. You know? And you know you really can’t understand something until you experience it. And so if you can really pull people into the experience of something you know and help them to really experience it differently, versus maybe just reframe it in a mental way. You’re really tapping into you know our elemental way of really being in the world. You know I think about it like developmental movement like you know, my little daughter now you know it’s you know she’s starting to go through now, she’s you know can kind of roll a little bit, she can lift her head you know, there’s kind of these this alphabet of her experience that’s developing you know. And eventually you know she’ll be walking, I’m sure by the end of the year and you know all of that. But it’s like without all this other information you know, figuring out how to move one arm and one leg together and all of that. You know she wouldn’t really get to the walking part you know. And If something doesn’t happen correctly along that chain or you know, as a developmental movement therapist, we would really go back and re-pattern kind of the earlier movements you know. Dawn: Yeah. So like you know if you work in with something that’s going on with your body a lot of what therapy does is really kind of go back and re-pattern some of the earlier movement to get you really doing a movement differently from you know from the core of what that movement is. Does that make sense? Benay: And how you’ve, uh being in your own body to deal with that, before we get there though, I think there probably are a few coaches being like, wow, okay this stuff that Dawn’s saying sounds so amazing and so cool. How like, if somebody wants to add you know, this… What did you say, somatics… somatics as a tool into their coaching, how do they even get started? Where would you send them? Dawn: Oh, ah to me? hah. Benay: That’s a good start, ok. Dawn: You know it’s hard for me to really answer that question actually because my background is really in developmental movement therapy like I said. And so I can really come, I mean I could make a lot of referrals into that community, which isn’t necessarily a coaching community. You know I do know there is a book out there called ‘Somatic Coaching’ by someone named, I believe Richard Strozzi, I may be pronouncing his name totally wrong. It’s a really good start in terms of framing somatics in a coaching context. But the organization I am part of is the International Somatic Movement Educators Association, is meta and there’s a whole directory of practitioners on that website and there’s really a whole like realm of approaches that you could take in terms of techniques, you know to working with the body. I don’t know if you’ve ever heard of like Alexander technique or Feldenkrais Method. Alexander Technique was actually created by an actor to help him use his voice as gosh, I really shouldn’t speak about it because I don’t know, I’m not an Alexander practitioner, but from what I know of it you know it was created to help him use his voice more correctly. Benay: I’ve actually done a couple of Alexander techniques. Benay: With a guy who was in my BNI, Business Network International group out in Cameroon Yeah. It was fantastic, I loved it. Dawn: So that’s another somatic approach. Benay: People who are listening we will put links all to all that in the show notes ok? Okay, we do need to keep the show sort of within the time limit, let’s move on because I’m really interested. I know that there are listeners who are about to have their first baby and they’re running their coaching business and or they’re about to start one and they’re like you know this is all so new and they don’t really know you know how to handle it all. So I’d love to explore your experience with all that is still so fresh in your mind before you forget, because in a year or two it’ll all be like, yeah of course you know, it was…so let’s capture that if we can. So that’s the first question I have is, can you kind of paint a picture about what you were thinking about and what your focus was when you were actually just pregnant, you know you knew that going to happen. Yeah, can you set the stage for us there? Dawn: Yeah I was going through a lot of shifts when I was pregnant. The really basic thing that was kind of my first priority was my husband and I were actually joining businesses, so we’re moving our studio and trying to create you know a really sustainable framework. So I was kind of decluttering my business. You know if that makes sense, like trying to get rid of all the systems that didn’t work and get everything working really cohesively and get us in the space that we know we could be in. So sort of nesting with my business. Yeah, that was the first thing I was really working on and that was part of my maternity plan. My husband actually, he also teaches movement, the same movement system that I teach, Gyrotonic, and then he’s a massage therapist as well so he covered all of our clients while I was out. So it was we were really setting up the structure for that to happen. And then I was focusing on you know knowing that you know my business has been really physical in the past, you know I see private clients and movement training and do movement training with them. And realizing I was really wanting to make a shift with that and knowing that you know I really had no idea what having a baby was going to be like. You know I mean everybody can tell you but until you experience it, it just goes right over your head. So I definitely had an intuition that I really, before that even that, I really wanted to shift my business into more of a coaching context and find more ways to reach more people without necessarily just doing one on one coaching work. And so I got really interested in product development. I actually took your course. That was when we started gosh, I believe I was just starting my second trimester, and I was I think the last week of Next Gen was the week I was due. You know, I really just kind of went full on into that. And I also knew it would be a really great support structure for me. You know just as kind of pregnancy kept going and it gets a little uncomfortable towards the end, and it was really great to just have that as you know as a way to really keep my mind active and feel like I could continue to move forward in my business even though I felt like I couldn’t move very much at all towards the end but. So yeah I was just really focused on solidifying my business structure so that it felt like you know it could really kind of run itself on some level you know, and then starting to get as much as I could get done in order to get these products created so that I could keep in touch with my clients potentially through these coaching products when I was out and then also had kind of a new business structure to come back to after I had my baby. So so that was really what I was focusing on and I’m really glad I did the work ahead of time. I’m glad I completed the work with you. Benay: Yeah I remember our early conversations, should I. shouldn’t I. But I’d like to put in a word for Dawn, she is a hard worker and gets on with the work. So I think it was your work ethic really that that made all that happen, and your drive to just see this through and really your commitment to your business. You know once you’ve got your teeth sunk into this is what I’m going to do and it’s going to work, dammit, then nothing stops you. Dawn: For better or worse. Benay: That’s kind of how I’ve been with my business I call myself sort of a stubborn wombat. I’m just like plow through…waddling. Especially now with my ankle. Okay. Excellent. So that was your focus, you were really on fire and pregnant at the same time and you know you had your baby right at the end of our course, which was pretty awesome. Dawn: I think I actually emailed you when I was on the way to the hospital because I was like I think we are gonna have to postpone this. Benay: I don’t think we can have our meeting, Benay. Haha. Okay, anyway, so now then you had your beautiful daughter. And what was the reality once she was born and you started to really understand? Dawn: Yeah it was a complete, completely different world. I mean I really didn’t expect… It’s amazing. I really I love being a mom and I just I’m completely in love with my kid. It’s just been really great, but it was it was really, really hard in the beginning you know and I think that I just really didn’t expect, I kind of figured you know I’d have the baby and then I’d kind of go back to the way things were. Dawn: Once we kind of got her on a sleep schedule, well okay its kind of good. And it really just transformed my life in a lot of just kind of a core way, you know. And I really noticed I mean kind of once I got out of the fog the first few weeks, you know maybe around Christmas time, I really noticed, especially in regards to this whole idea of being in your body just how present she is you know? And how present I need to be to really be with her, and to really absorb and take in the joy of that experience. You know? And it kind of knocked me off my card a little bit because I thought I was all present, you know? I kind of had this covered somewhat you know and I just realized all these tendencies I sort of had to try to you know multitask in ways that you know kind of kept me from really being fully present. And just also just to I think let go of control. I think that really came up for me too. You know in the struggle in those first few weeks and first few months you know to really just you know allow that relationship and experience to happen and let that kind of be the guide, which you know really goes back to kind of a somatic approach as well you know. You really allow your experience to really guide you and help shape even what your goals are you know. And I think I definitely saw that happen you know with me, where I had this kind of specific idea what my goal was even with my coaching business and it really didn’t play out in that way. You know I thought I would kind of have the baby and then get right back to work on you know on all my products and I would have something out by January. And I don’t even think I really, I mean I think we squeezed in one other session in December to finish up the program. But other than that, I mean I didn’t really touch anything until February, late February even. So you know and then I kind of had a different focus with that when I came back you know, and I definitely appreciate having done all that work ahead of time because when I came back to the work I’d done in Next Gen, I realized how much I already had put together and now I’m just putting on kind of the finishing touches and you know really kind of evolving what I want my signature program to be. So you know but it’s it’s just really it’s all changed you know, and I think my intuition was definitely right that I really needed…my business needed to expand because I was expanding. You know? Da Da Dun. Yeah, it really needed to expand with me, because now my time is just different. You know? It’s not only my time anymore. I feel like it’s kind of her time. You Know? So anyways so my time is different my time is more important and I really want to be able to still give everything I can give to my business but it really needs to, it can’t take everything from me anymore. And I definitely was you know giving probably maybe over extending a little bit too much. Benay: Yeah that’s really I mean I actually found my daughters six now, but I found a really similar experience happened to me when I had my daughter. It was like all the sudden your time has different meaning. So when you work your business you have to be more efficient. Otherwise, it’s just going to cease to exist. So it not only forces you to be more efficient in your business but I found too, it even then have the same impact on my husband, but having a little daughter around that like you said about being 100 percent present. It really makes you up your game like you have to be the best you can be because now you’ve got this little angel watching you, you know? And they deserve your best. So yeah it is a really challenging, but beautiful experience. That I think having a kid is much harder than having a business personally. Dawn: Yes it is. I have to say now that I’ve started back at the studio this month and it’s a relief. Benay: Oh I get to work, its fun! Dawn: Ah, you know it’s just me. I can stretch on my breaks, I have this time to do this stuff. But I do have to say one of the core things that I did in Next Gen that really helped me though too was just really getting clear about my schedule in really easy chunks. You know you really helped me with that. Rather than you know having all these little chunks of time where I’m doing all these different things you know just having like from nine to 12 on this day I just do X and then you know whatever I need to do and that feels X, I can do it that day you know. But not having to have it be too rigid you know because with a kid it just can’t be rigid you know. And then I really think too, I really try to think about setting priorities every week too. But really setting priorities holistically, so thinking kind of bringing myself into my body again too. And really thinking about like how I want to feel in my life. You know and the different aspects of my life that I really want to be present within my week and you know letting my priorities not be too loaded into one kind of element or another you know. So, I really feel like I am you know, my week is really balanced too and my priorities are balanced. You know it’s not to loaded on work, which tended to be before I had my daughter. So I’d say that’s changed too. And been a really helpful tool that helped me in the transition to being a mom. Benay: That’s good. I like seeing you on, uh we’ve got a Facebook group, if anybody wants to join, it’s for online coach entrepreneurs. Every Monday I will say ‘Have you set your priorities for this week?’, And its just a little poll and you say yes or no, Dawns’s always there saying yes! Well done! Just making that little list so that you know that you’re moving ahead. And I do it too, where I do all parts of my life, not just my business. Benay: Okay so you’ve kind of covered off on my next question a little bit. But you know how have you used your skills as a coach and bodywork expert to help yourself transition to motherhood and entrepreneurship at the same time. You mentioned, you mentioned a couple of things, but do you want to do a quick recap for anybody who is in a similar position? Benay: I think that’s fair enough, Dawn! Benay: If somebody’s listening you know kind of is like, ‘wow, okay this sounds really cool I’m interested in adopting one of these practices’, could they do that little meditation that we kicked off with at just a start, I mean it’s not 10 minutes but it’s something. Dawn: Sure, that’s Something. And I actually have a really great freebie on my website where I have a similar meditation. I have a link with an audio with it and everything. And you know you can also just go and download that as well and have a hard copy of it so. Benay: That would be perfect. Okay, so I think we have kind of, I think I think we’ve wrapped up everything. Just in case you come up with something else, I just want to throw this question out there, because I think you’ve actually answered it, but if you were going to give one piece of advice to that new parent and coach entrepreneur, that they take away from this episode, what would that be? Benay: One, yeah, like this is the one thing that you want them to action. Dawn: You know I would just really say take care of yourself. I mean make sure you really take care of yourself, because you take her yourself then you can take care of your business and take care of the other things in your life. But if you really let that go, you know, and you start to let all the other things encroach, then you really start to lose your footing. So I think it’s super important to really take care of yourself and really find you know find your support team, so and your support structure within your business, within your life. Benay: Okay you’re getting two now. Benay: Okay, and your body knows I think. It will tell you. Right? Dawn: Exactly. I mean I think that’s a really big key actually like even if you just check in in the morning like you know like we just did you know at the beginning of this podcast, you know just drop in your body and just check in and like what do I need to do today for myself? Like what’s going to help me feel the best in my body today? You know something will come up and you’ll know. You know I mean your body knows. And something will kind of show up intuitively and if you can really just trust that, it can be a really profound practice and a way of trusting yourself, you know and listening and really just having a daily dialogue with your body. So. Benay: Okay. I love that. So there’s an actionable piece for everybody. Benay: When you wake up in the morning, you open your eyes, you say you do a quick body scan and you say what does my body… What did you say? What does my body need today? Benay: Excellent. I Think everybody in the world did that every morning we would…the world would be an amazing place. Benay: Even more amazing, let’s put it that way. Okay, Dawn we really got to wrap up. We’ve gone a little bit already. We have so much to cover, it’s kind of like we’ve covered two podcasts and one. Benay: But It was so awesome to have you on the show. If somebody wants to find out more about you or maybe even grab that freebie where can they go to get that? Dawn: Yeah you can just go to my website, its just my name, dawnstrom.com. And you can sign up for the freebie on my website and you’ll also just get any links to my, I sort of do blogs every week and also send out e-mails at them offering any new services or programs and so forth. So yeah it’s all on my website. I also have a link if you want to schedule a 15-minute consultation. You know, talk to me in person and we can chat a little bit. You can do that as well. So. Benay: That’s awesome. Well, thank you so much for being on the show. And if you if… Listeners, thank You so much for listening to another episode of Coach Pep Talk and you can help us out by liking the show on iTunes. That would be greatly appreciated. All right we’ll wrap it up here. Happy coaching everyone.